Quentin Cooper tells the story of Kathleen Drew, a British scientist treated like a goddess in Japan. At a festival in her honour, he meets fishermen who owe her their livelihoods. Every year in Uto, a remote town at the Southern tip of Japan, a festival is held to celebrate a woman known locally as the Mother of the Sea. 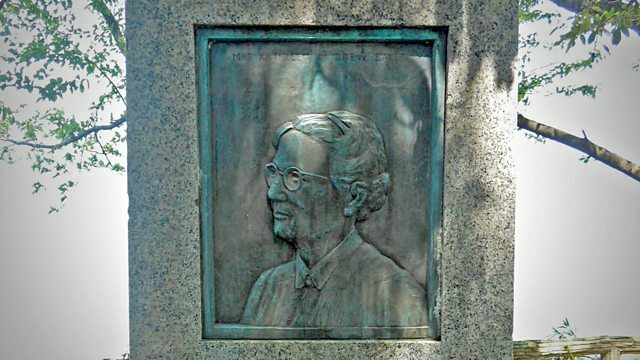 She's not a figure from folklore, or an ancient goddess, but a British scientist, who never even visited Japan. She was Kathleen Drew, and her work studying the lifecycle of edible seaweed on the North Wales coastline in the 1940s revolutionised the Japanese production of nori - that dried edible seaweed you find wrapped around sushi in high-end restaurants and convenience stores around the world. Her discovery, picked up by chance 6000 miles away from her lab in Manchester, enabled nori farmers in Japan to turn this nutrient rich food stuff from a gambler's harvest to a reliable large scale crop. Now they gather each year on 14th April at the Drew Monument, inscribed with Kathleen's image, to give thanks to her with Shinto prayers, offerings and specially composed songs. Looking out over the nori fields of the Ariake sea they ask Kathleen, who died not long after publishing her ground breaking study, to watch over them and increase their yields. Quentin Cooper has been fascinated by Kathleen's remarkable story since he heard about it by chance several years ago. He travels to Uto to celebrate the Drew Festival with the fishermen there and to hear why a scientist all but forgotten in her home country means so much to them.